This blade belongs to Jo saku ranking. Habaki : Shakudo double Habaki with some gold color. Blade length : 40.7 cm or 16.0 inches. Sori : 0.7 cm or 0.28 inches. Width at the hHamachi : 1.97 cm or 0.78 inches. Width at the Kissaki : 3.05 cm or 12.01 inches. Era : Edo period Kanbun era. Shape : The blade is wide and thick with small curve, long Kissaki nice looking shape. Jitetsu : Itame-hada well grained with Jinie attach and also Chikei work blackish Jigane. Hamon : Niedeki Gunome Midare Hamon with deep Nioikuchi. Boshi is also having deep Nioikuchi Midarekomi style and turns back Yakisage style. Special feature : The founder of the Mizuta Kunishige school started around later Kamakura period as a lineage of Ko-Aoe Tamtsugu school. Generally this Mizuta school become very active during later Muromachi to Edo period. 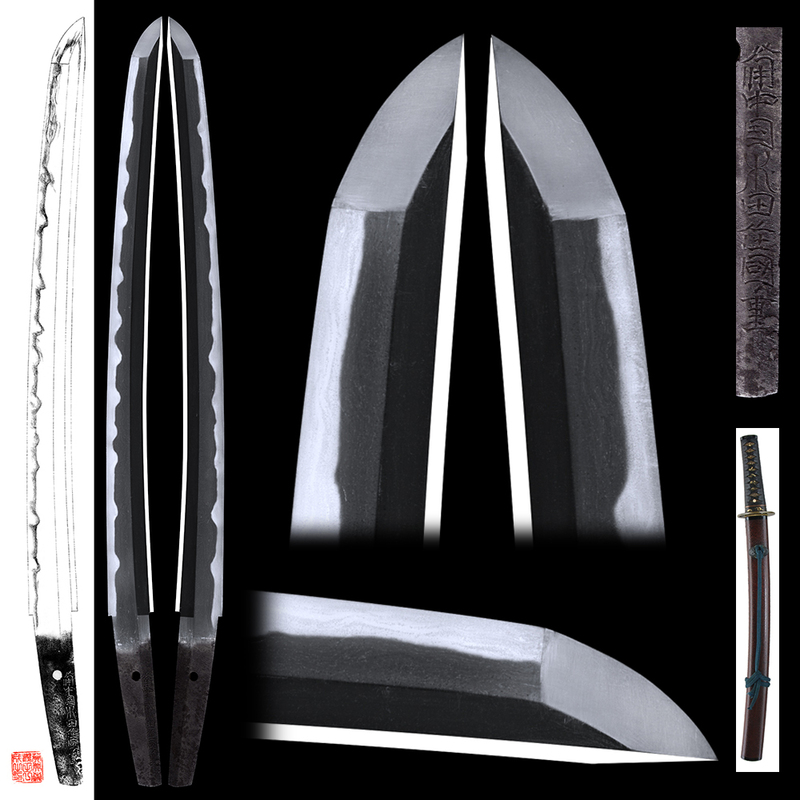 We could see the blades with secular name engraved on signature like Oyogo Kunishige, Kawano Rihei Tameie, Yamashiro Daijyo Kunishige. Most of the blades are having active wild deep Nioikuchi Hamon and so as This one. Saya : Russet colored Ishimeji Saya. Tsuba : the River engraved and pteridium herb carved on brass plate with gold and Shakudo color. Hatch of a waterfowl is also engraved openwork. There is a signature mentioned as ‘Katsutaka’. Fuchi : Shellfishs carved on Shakudo plate. Kashira : Shakudo plate. Kozuka : Mansion in mountain carved on Shakudo Nanakoji plate.